"Did you think this was all a game? Is that what you thought? We are not a game ... We are real. This room, here, it is real." The "second life" massively multiplayer online games offer is not merely a distraction or an addiction. It is a space for reinvention and exploration. These games offer a new frontier, and while they are home to much of the same antisocial behavior and vices of real frontiers throughout history, they nevertheless offer genuine opportunities and benefits that should be fostered, not condemned. Frontiers have always been an escape valve, and in a world with increasing social regulation and decreasing space, it may be that a virtual outlet is the best we can hope for. In 1893, Frederick Jackson Turner revealed his famous Frontier Thesis, arguing that America's greatness and vitality sprang from the freedom found in the nation's frontiers, frontiers that had by then become closed. Faced with the loss of these "free lands," Turner wondered what changes to the nature of democracy, individualism and other American ideals were in store. The Wild West, after all, like the New World before it, had been an outlet in an often stifling world, a place of autonomy (due to the lack of enforced order) and economic opportunity (due to the presence of massive unclaimed resources and few constraints on trade or industry), and - perhaps most importantly - a place for rebirth, where old class norms, past offenses and personal shames could be escaped. With the closing of the American frontier, there was just no place left. Robert Heinlein ends his own ode to anarchic frontiers, The Moon Is a Harsh Mistress, with free spirits leaving behind their increasingly civilized Luna for the asteroids. 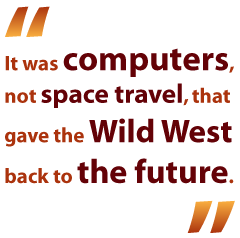 But it was computers, not space travel, that gave the Wild West back to the future. A bit over a century after Turner declared the frontiers closed, Origin Systems unveiled Ultima Online and opened a new one. To be sure, other games - from text-based MUDs to early graphical MMOGs like those offered on AOL or the Sierra Network - had provided virtual space for a variety of interpersonal interaction. But it was UO, with its wealth of options and strikingly detailed environment, that spawned the first mass migration from the real world to a virtual one. From UO onward, MMOGs have been home to exactly the sort of behavior one might expect in the Wild West, whether it was land speculation rife with fraud in Second Life, prostitution and muckraking in the The Sims Online, dishonest bankers and bank robbers in EVE Online, banditry and bounty hunters in UO, and - naturally - virtual slave labor by Chinese workers. Fringe societies attract fringe elements, of course, and thus online gaming - like real-world frontiers - has the same distorted reputation of wildness and anti-social behavior that we associate with the Wild West. To be sure, there may be more griefers in WoW than there were bandits in Dodge City, and just about everyone makes his way as a cold-blooded killer for hire (of mobs if not Apaches), but nevertheless focusing on the negative elements of MMOGs is ultimately not the most productive way of understanding those communities.